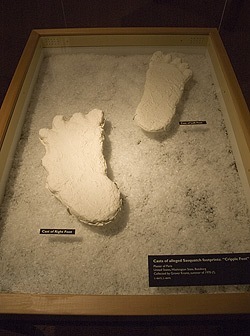 In late February 2008 there was an exhibit in a museum at the University of California at Berkeley regarding the subject of bigfoot research. Among other things the exhibit displayed the Bossburg Cripplefoot casts, collected by Dr. Grover Krantz (now deceased), who used to work at that Berkeley museum. Click here for the article about the exhibit. Dr. Krantz was the first anthropologist to openly state his interest in the mystery of bigfoot sightings and track finds. These casts are what made him an advocate. "Before I examined these prints, I would have given you ten to one odds that the whole thing was a hoax," he says in his book. "But there is no way that everything could have been tied together so perfectly in a fake." Berkeley Professor Sherrilyn Roush's recent talk comparing the emergence of bigfoot research to the early scientific dismissal of meteorites, is both insightful and highly relevant to this subject (See the article about her talk at the museum.). Professor Roush is a philosophy professor, not a scientist. Her discipline allows her to see the forest through the trees, with regards to science history, much better than most scientists. She is also an expert on concepts such as "radical probabilism" and "coherent betting behavior". Click the image to the left to launch a YouTube clip of a 1970's documentary about the subject. 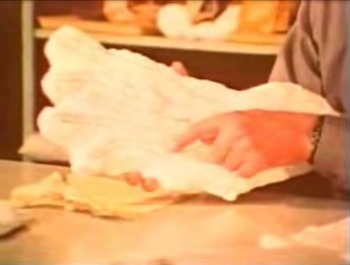 The clip shows, among other things, Grover talking about the anatomy of the Cripplefoot casts. 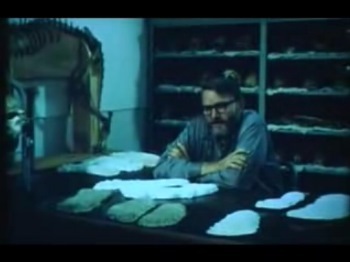 A portion of another documentary featuring Grover Krantz. This particular documentary "The Mysterious Monsters" was shown in shopping mall cinemas across the country in the late 1970's. It was the first time the general public saw a well informed scientist discussing evidence of sasquatches. Click on the image to the left to launch a 10 minute YouTube clip of the documentary.